The round barn has a significant place in the agricultural history of the Midwest. It may have been considered an unconventional shape when compared to a standard rectangular barn, but proponents of the round barn argued it was more economical as it used less materials to build and had a more efficient use of space. There were over 200 round and polygonal barns built in Indiana between 1874 and 1936. As these barns age and deteriorate, it becomes more challenging and more expensive to maintain these historical buildings. A symbol of our agricultural heritage is slowly disappearing from the countryside. Luckily, this was not the case for a round barn located in Howard County. Lawrence Armfield built the round barn on his farm in 1909. More than 100 years later, the barn was beginning to deteriorate and restoring the barn was proving to be a costly endeavor. In 2011, the barn was donated to the Greentown Lions club and moved to the local county fairgrounds. While the barn was restored to its original red color, a change was made in the roof. The original roof was a cedar shake which would require regular maintenance. The decision was made to replace the cedar roof with a standing seam metal roof due to steel’s low maintenance requirements and increased longevity. The unique shape of the round roof required the standing seam panels’ width to taper as the panels sloped up towards the center of the roof. Heritage Goodhew Enterprises of Ridgeville, Indiana took on the laborious task of hand forming and installing the standing seam panels. They chose to use Coated Metals Group 26 gauge steel in Slate Gray for this project. Heritage Goodhew Enterprises was passionate about this project as they understand the important of preserving history. Their company was founded in 1957 by Wayne Goodhew and has remained family owned and operated by four generations. While the metal roof on this 109 year old barn was installed seven years ago, it looks just as good today as the day it was installed. 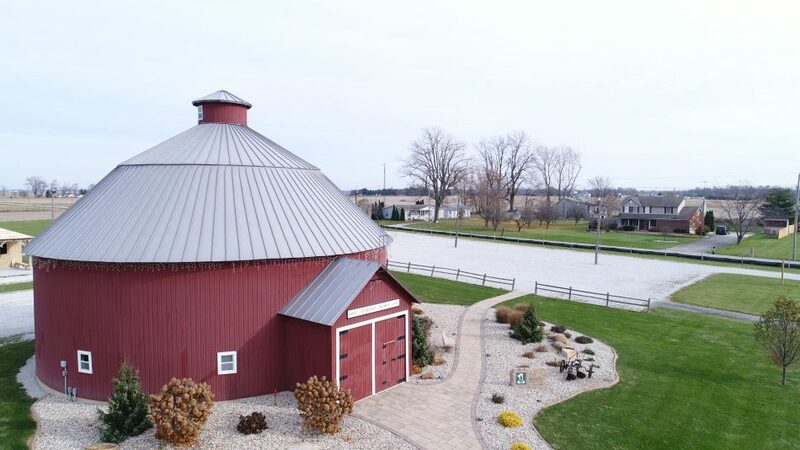 This project is a true testament to the importance of choosing a quality material that will stand the test of time, allowing this beloved round barn to remain a reminder of Indiana’s rich farming heritage. Sky Squid Details is fully insured and licensed by the FAA.